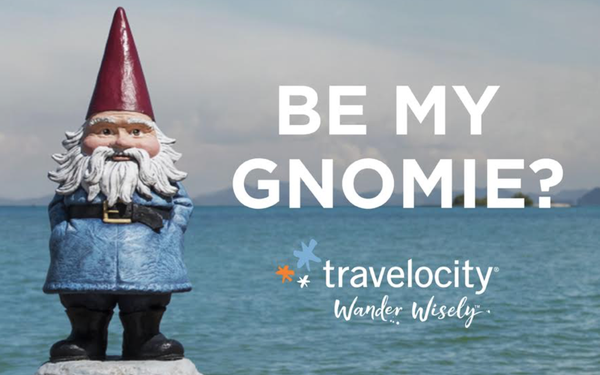 Travelocity is taking a page from online dating websites with a contest that invites consumers to convince the Travelocity “Roaming Gnome” to pick them to be his travelmate. The campaign, “Be My Gnomie?,” was developed and created by advertising agency 3Headed Monster, Dallas, and is its first work for the travel search brand. It runs through late January. Interested suitors are invited to convince the gnome, via Instagram photo or video, that they’re the one he needs to bring along on a vacation. The prize is a 10-day Caribbean vacation for two. The effort targets Millennials and the primary media is Tinder, where the gnome has what appears to be his own dating profile page. The paid unit, called a “Branded Profile Card,” is the second of its kind that Tinder has sold (the first was Captain Morgan), and consumers can get contest entry details by “swiping right” on the Roaming Gnome’s profile. Display banners are running on other dating sites such as Match.com, OKCupid, PeopleMedia. Entry details are at www.travelocity.com/bemygnomie. Entries are posted on Instagram under #BeMyGnomieContest, @RoamingGnome or @Travelocity. So far, many are photos taken with a gnome in unique locations like on a cliff face, in a garden or above the Greek seashore. One entry is with the world’s largest gnome in Ames, Iowa, and another is a rap video. 3Headed Monster will build on the activation by retweeting amusing entries and engaging with selected entrants, and also by posting a series of daily videos from the winner’s vacation. The prize includes stays at three newly opened boutique hotels, in Montego Bay, Jamaica; Baha Mar, Nassau, Bahamas; and Punta Cana, Dominican Republic.